In the past there have been two large studies of the existing data which suggested that working long hours increases the risk of coronary heart disease (CHD) by approximately 40%. These studies were, however criticized because they used only published studies, which might reflect a “positive publication bias” considering the fact that positive studies are more likely to be published. However, to test this, researchers concentrated on this issue by performing a Prospective Trial. Kivimäki and colleagues have addressed such concerns and examined new CHD events among 603,838 individuals and new strokes among 528,908 individuals. The results were adjusted for socioeconomic status as well as age and gender. The results demonstrate that individuals working ≥55 hours weekly experienced a 13% increase (95% CI, 2%–26%; P = .02) in the relative risk of CHD and a 33% increase risk of stroke (CI, 11%–61%; P = .002) compared with men and women working 35 hours to 40 hours weekly. The authors found no factors that could have influenced the results; however, there was an effect of socioeconomic status on CHD among high-quality studies. Specifically, the relative risk of developing new CHD was increased 118% and 22% in the lowest and intermediate socioeconomic status groups, respectively, but decreased 13% in the highest socioeconomic status group. This large meta-analysis of published and unpublished studies demonstrates that there is an association between hours worked and an increase in both stroke and CHD risk. The risk increase is more prominent for stroke. The mechanisms are not clear, but the authors suggest that less leisure time and physical activity, repetitive initiation of the stress response, increased alcohol consumption, and neglecting to attend to one’s health are all probable among those working longer hours. There are some things that we intuitively believe but cannot prove. For example, the statement “you will work yourself to death” is commonly used but has not been scientifically proven. In reality, that wish list includes things we should be doing for all of our patients and ourselves. However, this study tells us that if we work long hours, then it is even more urgent to do these things right now. 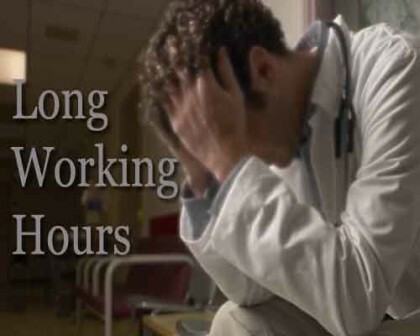 This is especially true for doctors, who are working long and continuos duty hours in hospitals. Medical professional are strongly advised to take short breaks in between long hours, whenever possible to restore their energy and protect their health.